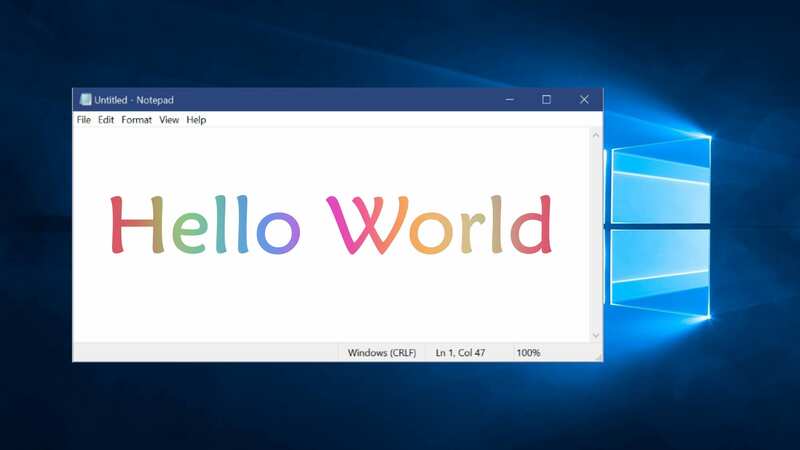 Notepad, a simple text editor for Microsoft Windows and a basic text-editing program, has got its first major update in years. For those unaware, Notepad was first released as a mouse-based MS-DOS program in 1983, and has been included in all versions of Microsoft Windows since Windows 1.0 in 1985. It can be used as a digital diary to write notes, create documents, write HTML codes, etc. Microsoft have tried to meet the needs of their users by updating Notepad with a bunch of new features. The upgrade will be useful for users who use Notepad for development, logs, or simple text manipulation. The new Notepad features will allow users to not only change font sizes onscreen, but also zoom into the text for easier read just by simply holding the Ctrl button and the + or – keys. It will also add a feature that will allow users to delete a previous word just by using ctrl + backspace. Besides these, it also has made some improvements to find and replace experience on Notepad, including the option to do wrap-around find/replace to the find dialog. “A long outstanding request has been to add the ability to display line and column numbers when word-wrap is enabled,” the company added. A few other fixes, such as improved performance when opening large files, arrow keys now correctly unselect text first and then move the cursor. Further, while saving a file in Notepad, the line and column number no longer reset to 1. Also, Notepad now correctly displays lines that don’t fit entirely on the screen. The new Notepad features are a part of the Windows update that is currently codenamed Redstone 5. It has already been released for Windows Insiders in the Fast ring in the form of Windows 10 Insider Preview Build 17713, who can now go ahead and download the latest build to experience the new Notepad App for Windows. However, the remaining users will have to wait to for the Redstone 5 to be released later this year. Besides Notepad updates, Microsoft has also been working on improvements in the Build 17713, which includes providing users with new controls over auto-play videos in to the Windows 10 web browser Microsoft Edge, speeding up Sign in option in Windows 10 Shared PC, Dictionary function in Edge PDF reader, strengthening the Windows Defender Application Guard, and adding biometrics in the Remote desktop for additional security. You can read more on what’s new in Build 17713 by clicking here.